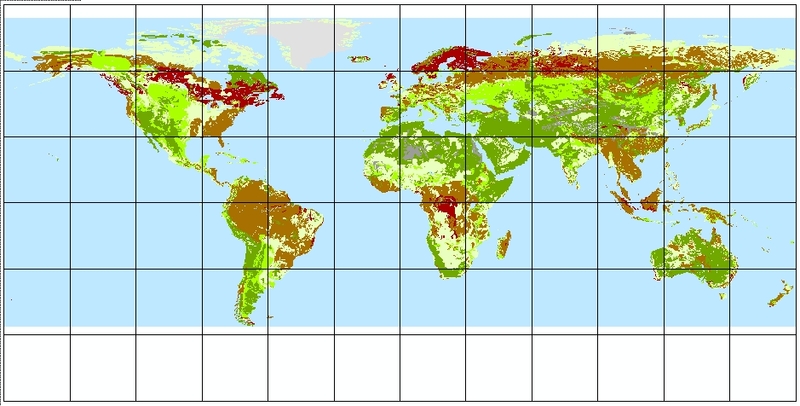 Version 1.2 of describes a harmonized dataset of derived soil properties for the world. It was created using the soil distribution shown on the 1:5 million scale FAO-Unesco Soil Map of the World (DSMW), rasterised at 5 by 5 arcminutes, and soil property estimates derived from the ISRIC-WISE soil profile database, version 3.1. The dataset considers 19 soil variables that are commonly required for agro-ecological zoning, land evaluation, crop growth simulation, modelling of soil gaseous emissions, and analyses of global environmental change. It presents ‘best’ estimates for: soil drainage class, organic carbon content, total nitrogen, C/N ratio, pH (H2O), CECsoil, CECclay, effective CEC, base saturation, aluminium saturation, calcium carbonate content, gypsum content, exchangeable sodium percentage (ESP), electrical conductivity, particle size distribution (i.e. content of sand, silt and clay), content of coarse fragments (> 2 mm), bulk density, and available water capacity (-33 to -1500 kPa). These estimates are presented by FAO soil unit for fixed depth intervals of 20 cm up to 100 cm depth (or less when appropriate) for so-called virtual profiles. The associated soil property values were derived from analyses of some 10,250 profiles held in WISE using a scheme of taxonomy-based taxotransfer rules complemented with expert-rules. The type of rules used to derive the various soil property values have been flagged in the database to provide an indication of the possible confidence in the derived data. Most map units on the DSMW are complex, comprising up to eight different soil units. Assessments and model applications that use the derived soil properties therefore should consider the full map unit composition and depth range. The soil property values presented here should be seen as best estimates based on the current selection of soil profiles in WISE, the procedure for clustering the measured data, taxotransfer scheme used for deriving soil, properties, and the spatial data of the digital Soil Map of the World. The derived information may be used for exploratory assessments at a broad scale (< 1:5 million; 5 by 5 arcminutes and coarser), pending the global update of the information on world soil resources at more detailed scales, upon due consideration of the underlying generalisations and assumptions. 1) Batjes NH 2012. ISRIC-WISE derived soil properties on a 5 by 5 arc-minutes global grid (ver. 1.2). Report 2012/01, ISRIC - World Soil Information, Wageningen, 57 p.
Raster data and MSAccess tables (about 10 Mb zipped; 100 Mb unzipped); these files may be joined using GIS. 82f3d6b0-a045-4fe2-b960-6d05bc1f37c0 Access to the portal Read here the full details and access to the data.